Τότε Καλλίνικος ἀρχιτέκτων ἀπὸ Ἡλιουπόλεως Συρίας προσφυγὼν τοῖς Ῥωμαίοις πῦρ θαλάσσιον κατασκευάσας τὰ τῶν Ἀράβων σκάφη ἐνέπρησεν, καὶ σύμψυχα κατέκαυσεν. Καὶ οὕτως οὶ Ῥωμαίοι μετὰ νίκης ὑπέστρεψαν καὶ τὸ θαλάσσιον πῦρ εὖρον. ^ a b Haldon & Byrne 1977, p. 97. ^ Pryor & Jeffreys 2006, pp. 608-609. ^ Crosby 2002, pp. 88-89. ^ Partington 1999, pp. 1-5. ^ Forbes 1959, pp. 70-74. ^ Pryor & Jeffreys 2006, pp. 607-609. ^ Partington 1999, pp. 12-13. ^ Pryor & Jeffreys 2006, pp. 26-27, 31-32. ^ Pryor & Jeffreys 2006, pp. 61-62, 72. ^ Moravcsik & Jenkins 1967, pp. 68-71. ^ Pryor & Jeffreys 2006, pp. 609-611. ^ Roland 1992, pp. 660, 663-664. ^ Pryor & Jeffreys 2006, pp. 630-631. ^ Roland 1992, pp. 663-664. ^ Scott, James Sibbald David, (Sir) (1868) The British army: its origin, progress, and equipment, p. 190. ^ a b c d Roland 1992, pp. 657-658. ^ a b c d Cheronis 1937, pp. 362-363. ^ Ellis Davidson 1973, pp. 69-70. ^ Roland 1992, pp. 658-659. ^ Partington 1999, pp. 21-22. ^ Forbes 1959, pp. 83-84. ^ Partington 1999, pp. 6-10, 14. ^ Forbes 1959, pp. 82-84. ^ a b Pryor & Jeffreys 2006, pp. 614-616. ^ Pryor & Jeffreys 2006, pp. 610-611. ^ Pryor & Jeffreys 2006, pp. 378-379, 609. ^ Forbes 1959, pp. 86-87. ^ a b Pryor & Jeffreys 2006, pp. 617-619. ^ Pryor & Jeffreys 2006, pp. 616-617. ^ Pryor & Jeffreys 2006, pp. 628-629. ^ Pryor & Jeffreys 2006, pp. 624-626. ^ Pryor & Jeffreys 2006, pp. 627-628. Christides, Vassilios (1993), “Nafṭ”, The Encyclopedia of Islam, New Edition, Volume VII: Mif–Naz, Leiden and New York: BRILL, pp. 884–886, ISBN 90-04-09419-9. 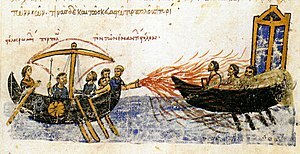 Greek Fire - The Best Kept Secret of the Ancient World. By Richard Groller.